and markets. And subject for today is Inverted Floor Plans also known as Reverse floor plans Kure Beach. know I was just watching my clients go through the processing, what they like and did not like. you’re close between several homes, which one should you pick based on this issue. example here and we saw some of these home actually and we we’re interested in all through. With an inverted or Kure Beach reversed floor plan you can have better ocean views for real estate on the 3rd and 4th rows than you can on the 2nd row with a regular floor plan. 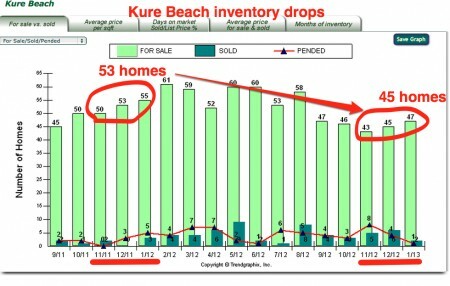 So you’re thinking about buying a Kure Beach condos (or surrounding city like Carolina Beach)…what do you need to know? What are the issues you may not have considered? There are 3 important variables to consider that are laid out in this video. When you look at the top quartile by itself it looks grim. And when you look at the medians it looks dramatic as well, however you’re just talking about slight dip or 440s to 430s with a short term trend up. 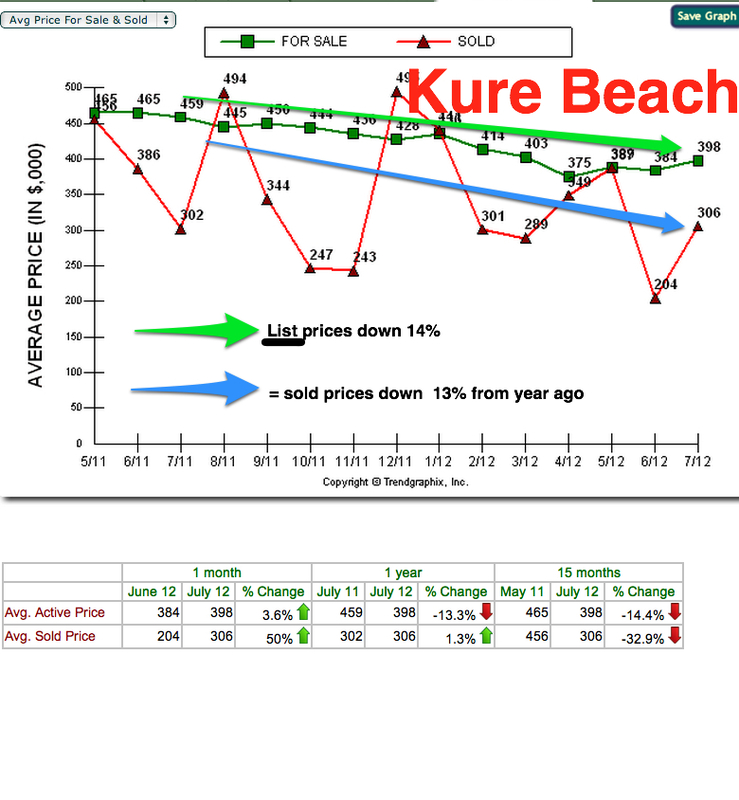 The challenge with Kure Beach real estate data is that there are so few homes sold each month that one can easily jump to conclusions based on what homes HAPPENED TO SELL THAT MONTH. 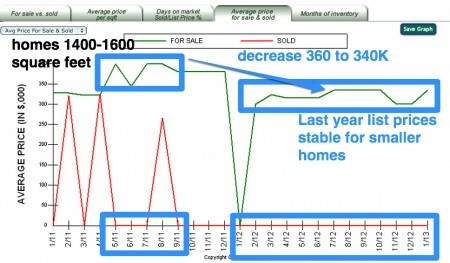 If a large home sells that month it throws off the numbers big time and distorts the market. So what is the reality of our niche beach market with oceanfront homes and the most colorful neighborhoods you can find such as Seawatch. Do the issue of this being such a small market one has to really be careful to compare apples to apples–that is similar size homes to similar size homes and compare home values and trends that way. See these 3 examples to get an accurate view of the market. Prices for smaller homes came down in 2012 but stabilized and remained steady the whole year. don’t think the prices will come down anymore. 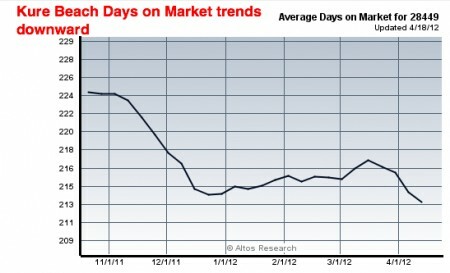 Possible 2-5% gain in 2013. If they did drop it would be a pittance and couldn’t justify waiting to buy when interest rates are going up. Prices for this size home are the same as May 2011. 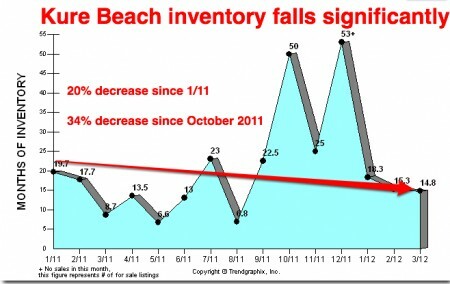 That sale in Febuary 2012 was probably an ocean view home…. And finally the luxury home sales in the area. 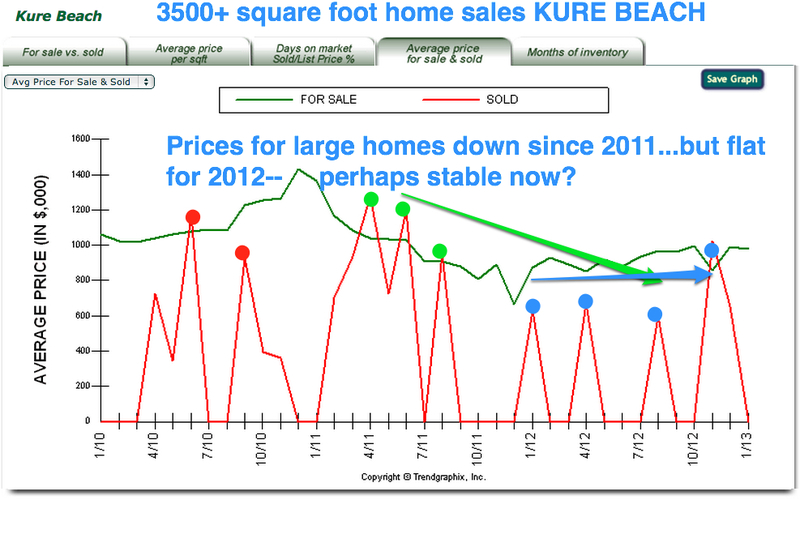 The blue arrow shows stable prices for these larger homes. 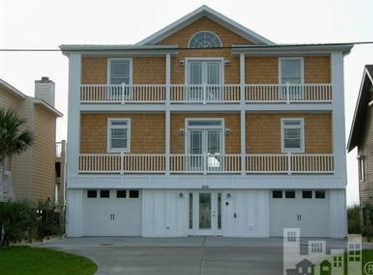 If you differentiated ocean view or oceanfront from the “regular” homes of similar size the numbers would be even more consistent or identical or flat. Prices totally stabilized in 2012 and will be flat in 2013 or bump 2-4%. Peace out. 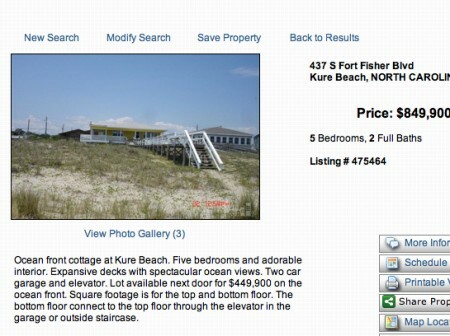 Kure Beach Vacant Lots for Sale–How much do they cost? Hi I’m Jay Seville the leader of the JustNewListings.com team and I work a lot Kure Beach dealing with homes for sale there we call a curry. outsiders or people coming into town from New York New Jersey they call it Kure beach and of course they have more interesting accents than I do. One of the common questions I get is how much are the lots? How much do these lots vacant lots cost to build on? And there are 3 scenarios to answer that question. 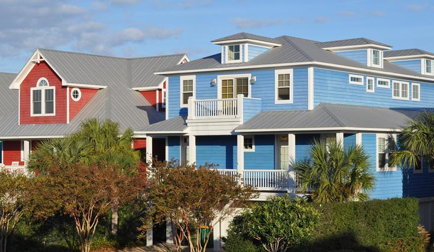 One you have oceanfront homes on Fort Fisher Boulevard; there’s North and South Fort Fisher. Then you have across the street lots for sale. I’ll call them 2nd row. They’re also on Fort Fisher have broken views. Sometimes they have little pieces of the front porch that sees the ocean or sometimes they are purely oceanfront homes however there is an empty lot across the street that just hasn’t been built on yet. And then the 3rd scenario is you go back 3 or 4 blocks how much do those vacant lots cost in Kure Beach? So let’s look at all 3 real quick and really just takes a minute to get a good assessment of it. This lot for sale on Fort Fisher Rd. South that sold for $390,000. That’s a pure oceanfront home. And here are 2 more homes for sale each of these sold for $500,000 in February 2012. 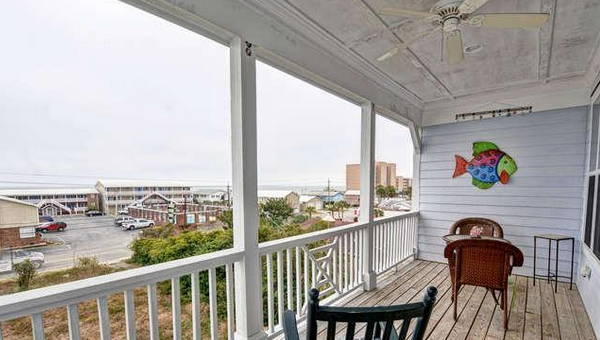 Generally the pure oceanfront homes are selling for about $480,000. If there is something not desirable on one side or the other side then they may sell as low as $380,000. If we go back to the second row these are the broken view uh, lots for sale or in some cases like this one nothing is been built across the street yet so it still is a pure Ocean view, and it sold for 200,000 in February. And here’s another that sold for 190,000 in July, but if you go further back… the lots if you go back further like three, four or five blocks they tend to sell around $150,000. Here’s one as an example. They are more expensive if they’re in a neighborhood with a whole bunch of amenities already so there you go. the oceanfront homes excuse me the vacant lots sell for 500, the 2nd row properties sell for 200, and if you go further back a few blocks generally the vacant lots in Kure Beach are selling for $150,000. 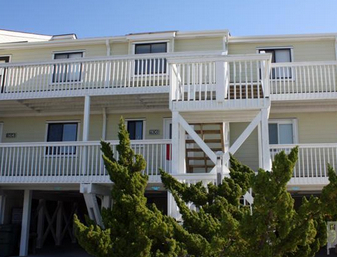 What is Value of 3BR 2BA Ocean Dunes Condo in Kure? How much are Ocean Dunes worth? 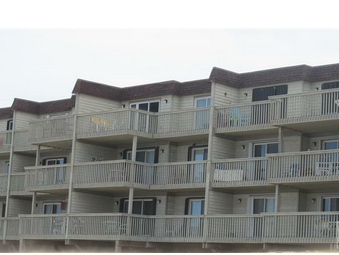 dead on oceanfront view or not? is there a 3rd full bath or not? 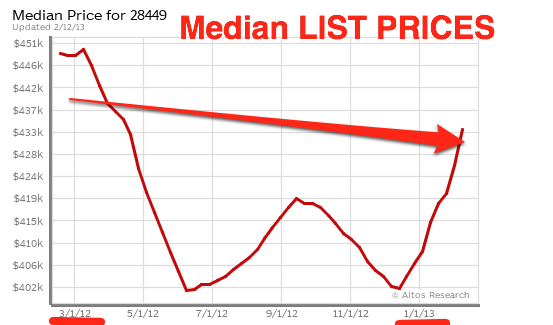 Bottom line for this new listing—it’s a legit list price. After living in Arlington Virginia where you pay $350,000 for a 1BR condo staring at another building I’m amazed at what Kure Beach has to offer. The 1BR condos here would be perfect investment properties for owners of Clarendon condos–just rent the unit out most of year to vacationers and reserve a couple weeks for you and friends. I’m just saying! 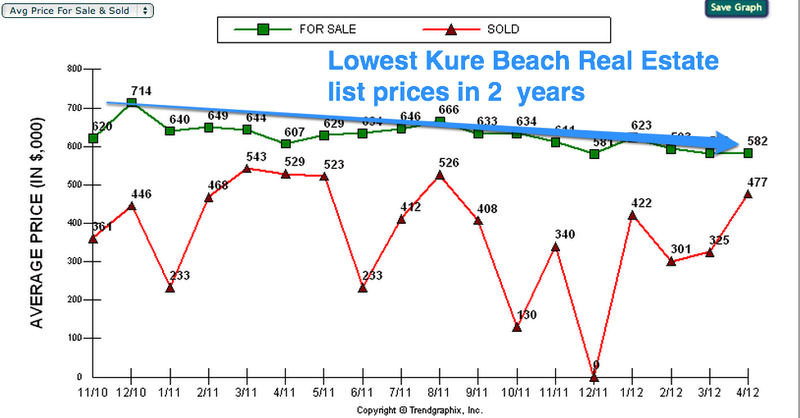 What is the latest and greatest for Kure Beach real estate? it’s always fun to ruminate when the new numbers come out–usually the 10th of each month. That’s when your true real estate bloggers who care more about the market and consumer advocacy and have more to say than what restaurant they just ate at come out to analyze. 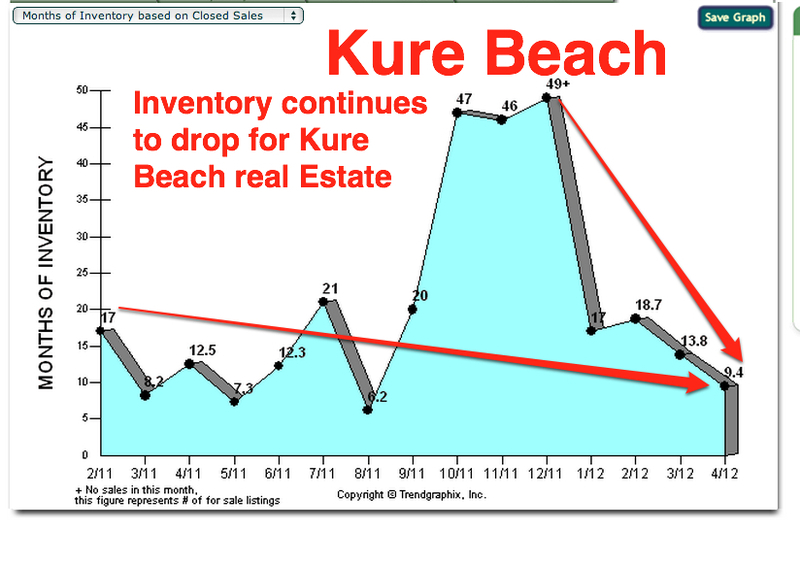 The one positive variable in the market data for Kure Beach real estate sales is that the inventory has fallen significantly the past 6 months. Is it long term or did just a bunch of upside downs homes get withdrawn so they can relist later in the year? 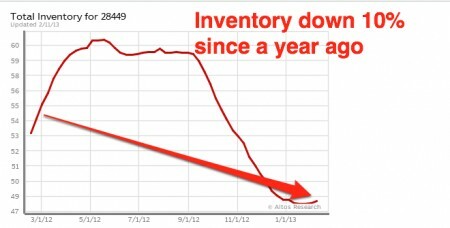 I’m thinking many of those homes were rented out but that can’t explain the big downturn in inventory. Prices have come down so much in past years–see this article on the Seawatch homes for sale price slide–that owners can use some positive news for a change no doubt. This is the past 6 months…. So now the question is whether prices have bottomed out. They may have–at least for single family houses. I’ll write about this more soon. 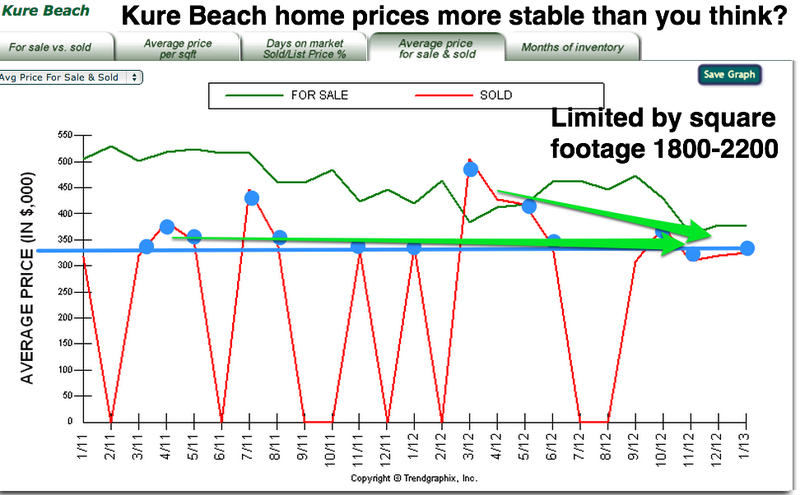 So how often does oceanfront Kure Beach real estate come on the market? 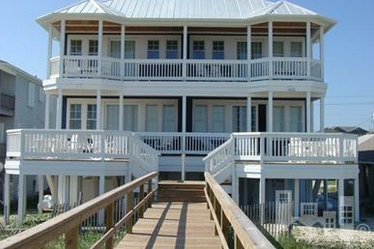 Well in the past year there has been 74 listings in the MLS classified as oceanfront . Half of them are condos and half single family homes. So that’s a new oceanfront listing for one either condo or single family home coming on the market about every 10 days….